Suggested Use: 1-4 tablets per dayor as directed by a health care professional. Thus, one cause of autoimmune diseases is thought to be the production of defective glycans by cells. For example, multiple sclerosis is an autoimmune disease in which certain nerve cell types produce defective glycans and thereby target themselves for destruction by the immune system. Accordingly, we will limit our discussion of DendroMax® to a brief summary of relevant research, and let you draw your own conclusions about what medical conditions it may be effective in treating. Sometimes the genetic programming that controls the Golgi Apparatus becomes damaged — either because of defective genes that become active at some point in life, or because of viral involvement. This can result in incorrect assembly of the glycans. When these defective glycans become part of the cell surface, they may be interpreted by the immune system as indicators that the cell is an invader or a cancer cell. Let’s examine several of these connections in more detail. by causing non-cancerous cells to be tagged as cancerous. The next step was to show that mice with multiple sclerosis can be successfully treated with N-acetyl-glucosamine. This was done using a strain of mice suffering from EAE (“Experimental Autoimmune Encephalitis”, a mouse version of multiple sclerosis), and the results reported in 2011.21,22 The report states that “… oral administration of the simple sugar GlcNAc enhances N-glycan branching while inhibiting … disease progression in EAE when initiated after disease onset.”22 About 7 days after beginning treatment, the glycan branching began to increase and disease symptoms improved. In a study published in 2000, N-A-G was tested in patients with Inflammatory Bowel Disease and Crohn’s Disease and found remarkably effective — “Eight [of the twelve patients] given oral GlcNAc showed clear improvement.”12 Despite this success, no further clinical studies appear to have been done — a sad commentary on the organizational abilities of the medical research establishment. Thus, indirect evidence suggests the possibility that treatments that induce glycan branching may reduce rheumatoid arthritis symptoms. The concept is now being tested in a clinical trial using a more complicated polysaccharide substance.30 However, N-acetyl-glucosamine is already available; it is inexpensive and can be safely tried by anyone. It makes sense to conclude that a glycan branching promoter such as N-acetyl-glucosamine would be a good candidate to test as a lupus treatment. Perhaps the lupus research establishment will someday explore this promising concept; in the meantime lupus patients can easily explore the concept for themselves, since N-acetyl-glucosamine is available as a dietary supplement. Multiple sclerosis… rheumatoid arthritis… lupus erythematosus… diabetes… Can so many medical conditions be ameliorated by one simple substance? Yes, they can — if they all share a common mechanism of action. In this case we do see a common mechanism: attacks by the immune system on tissues that are displaying faulty glycans on cell surfaces. When the faulty glycans occur in nerve tissue, you get multiple sclerosis; when they occur in joint tissue, you get arthritis; when they occur in connective tissue, you get lupus; when they occur in pancreatic tissue, you get diabetes…. Now, it may be that all these diseases can also be caused in other ways — for example, diabetes may sometimes be caused by pancreatic cancer rather than faulty glycan structure. So, a treatment that corrects glycan structure is probably not going to benefit diabetes patients whose disease is caused by cancer rather than faulty glycan production. And similarly for other autoimmune diseases. But a significant fraction of autoimmune conditions do seem to have glycan defects as an underlying cause. It makes sense to try a simple, safe, and inexpensive approach to deal with these conditions when there is still time to do so — or to prevent them from occurring in the first place. Glycan-based regimens are very safe, but they are new to the field of autoimmune diseases. Clinical studies are sorely lacking. It would be a mistake to substitute such regimens for standard medical treatments in cases where time is of the essence. Still, N-acetyl-glucosamine is non-toxic and is unlikely to interfere with standard treatments when both are being used simultaneously. Each DendroMax tablet contains 1400 mg of N-A-G and 1500 i.u. of Vitamin D3. Although very little clinical data is available for N-acetyl-glucosamine as an autoimmunity suppressor, the supplement has been on the market for years for other purposes. No side effects have been reported in the dosages used, which range from 500 to 6000 mg/day. As mentioned above, Vitamin D3 is another substance that can improve glycan structure. A combination of D3 and N-A-G may therefore work together synergistically. The suggested dosage of DendroMax is 1-4 tablets per day in divided doses. For example, a low-dose regimen would be 1 tablet once per day. A mid-dose regimen might be one tablet twice per day. A high-dose would be 2 tablets twice per day. N-A-G’s effects on autoimmunity take at least a week to develop. 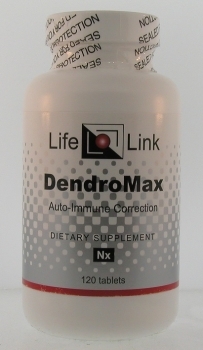 Are DendroMax® supplements useful for the conditions and purposes mentioned above? We aren’t allowed to tell you, so you should take a look at some of the references cited here, and then decide for yourself. N-Acetylglucosamine inhibits T-helper (Th1) / T-helper 17 (Th17) responses and treats experimental autoimmune encephalomyelitis J Biol Chem. 2011 Sep 29 Grigorian A, Araujo L, Naidu NN, Place D, Choudhury B, Demetriou M.